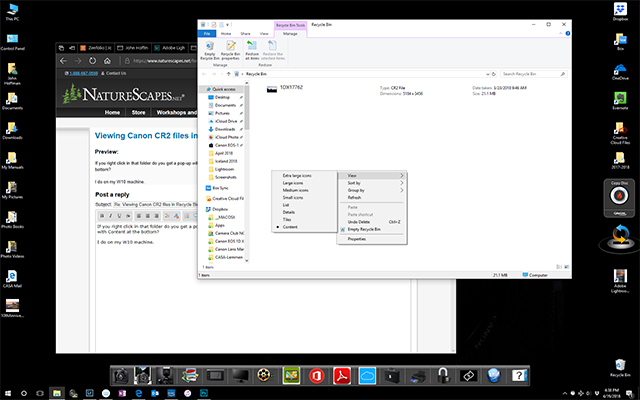 I recently upgraded my PC to Win 10, under the previous Win 7 I could pull up the Recycle Bin to look at thumbnails of the CR2 files doing a quick review before emptying recycle bin. Now the thumbnails show for jpg's but not the CR2. Using File explorer and opening a folder of CR2 files the thumbnails appear, just not reviewing the recycle bin. Any suggestions? You need to open the folder; not click on icon. I can't find a way to post a screenshot. If you right click in that folder do you get a pop-up with View, Sort by, View by, Refresh? And if you mousse over View do you get a pop-up with Content at the bottom? I do on my W10 machine. Sorry for my delay I have been away from my computer. I am able to get to the View - Content in your example, but the CR2 file only shows a box with what looks like 2 blue mountain peaks, no preview of the image except jpgs that are also in the recycle bin, have tried everything under view, List, Icons, Content, Details, nothing works. Must be some glitch with my version of win 10. I really appreciate you trying to help. Oh well, guess I will give up as I don't know what else to try.